Pet boarding is a popular and profitable addition to veterinary practices. 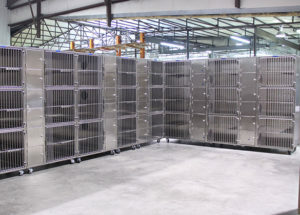 TriStar boarding kennels are built-to-last, with stainless steel, ergonomic design, and easy cleaning. Best of all, our luxury pet boarding products are priced affordably. Upgrading your boarding room with TriStar vet products provides you with a cleaner, more comfortable, and more efficient boarding room, whether you’re a veterinarian, animal shelter, doggy daycare provider, luxury grooming spa, or pet hotel operator. We pride ourselves on going above and beyond the industry standards to offer superior pet kennels that are all made here in America by expert craftsmen. Since 1983, our stainless steel equipment has been shipped from coast to coast for a variety of industries. In 2000, we dedicated our full focus to the veterinary care industry to combine expert manufacturing with the latest design innovations. You can feel good about our National Sanitation Foundation rating, which ensures that our veterinary medical equipment meets human hospital standards for cleanliness. • 1 ¼” stainless steel square tube frames (superior to the 1” industry standard). • Innovative side panel design to prevent cross-contamination. • Cross-breaks for added strength and durability with destructive or jumping dogs. • Enhanced welding and security features to better handle your escape artists. • Doors that swing both ways to allow kennel runs in narrow spaces and assist with aggressive dogs. • One-handed door operation to assist with squirmy, high-energy dogs. • Quiet operation with tack-welding to prevent rattling to assist with nervous dogs. • Stainless steel and powder-coated metal designs that never warps or swells like moisture, as laminate may. • Clear 1/4” tempered glass backs to enhance visibility. • Fluid-retaining portals and seamless coved corners that prevent dripping, leaks, and buildup. • Horizontal and vertical portals that satisfy a cat’s natural urges to explore, climb, perch, and socialize. • Perforated PVC ventilation tubes to keep healthy air circulating, with separate litter sections. • Additional storage sections above the litter area to maximize space. With our kitty condos, you enjoy full assembly done for you, alleviating the frustration of setup. Choose from custom dimensions for big or small cats, including tall, narrow condos to fill tight spaces. We offer single, double, or triple-stacked configurations to suit your needs. Customize further with over 100 powder coating colors or opt for a sanitary, hand-polished steel finish. • No more shifting, warping, or leaky seams, thanks to our fully welded, heavy duty 14-gauge stainless steel. • Superior draining and easier cleanup, with sloping and backsplash that sends urine directly down the floor drain. • Easy installation with a wall attachment that can be connected by any plumber. • Your choice of stainless or HDPE grate, with a 3/8” opening on all four sides to allow hair drainage. • Four-inch trenches (half the industry standard) to conserve water during cleaning. • Optional center drain setup, specially designed for back kennel runs. • Custom drain sizing to help you combat kennel odor problems. 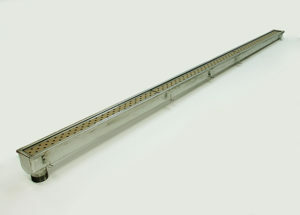 TriStar’s modern trench drains are designed for efficiency. If you’ve had problems with urine pooling, hair clumping, or drains clogging, an upgrade is long overdue. Choose a kennel trench drain with perforated grates that prevent animal paws and claws from getting stuck. Our smaller grate openings, catch basins, and sediment baskets catch animal waste before it enters the drain to ensure easy cleanup. There are numerous advantages to upgrading your boarding facility, no matter what type of business you own. Operating a clean, safe, and hospitable boarding facility can comprise as much as 50 percent of the annual income for a veterinary practice. Dedicated pet day cares or grooming spas are booming industries in their own right. Animal shelters with clean, attractive boarding facilities will adopt out happier and more well-adjusted animals. As a small town team, we believe in old-fashioned values – like personalized customer service and quality craftsmanship at a price you can afford. Contact us to discuss all your pet boarding kennel needs.